Aegis Technology Partners Ranked Among Top 501 Global Managed Service Providers by Channel Futures 3rd Year in a Row! We're honored to be recognized for the third year in a row for all the hard work our team has done on behalf of our clients. 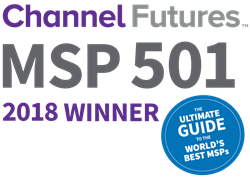 Aegis Technology Partners ranks among the world’s 501 most strategic and innovative managed service providers (MSPs), according to Channel Futures 11th-annual MSP 501 Worldwide Company Rankings for the third year in a row. "We're honored to be recognized for the third year in a row for all the hard work our team has done on behalf of our clients." said Jay Parisi, Partner, Aegis Technology Partners. "Our clients are our partners and we couldn't have done it without them." Channel Futures is pleased to honor Aegis Technology Partners.